In healthy individuals, the Zika virus causes flu-like symptoms. If a pregnant woman becomes infected, the unborn child can suffer from severe brain abnormalities as a result of mechanisms that have not yet been explained. A study by the Technical University of Munich (TUM) and the Max Planck Institute of Biochemistry (MPI-B) shows that Zika virus proteins bind to cellular proteins that are required for neural development. A few years ago, Zika virus spread across South America, posing a health issue with global impact. A significant number of South American women who came into contact with the virus for the first time at the start of their pregnancy by a mosquito bite subsequently gave birth to children with severe disabilities. The babies suffered from a condition known as microcephaly; they were born with a brain that was too small. This can lead to intellectual disabilities and other serious neurological disorders. Scientists succeeded in proving that these deformities are caused by Zika virus infections, but so far they have been unable to explain why. 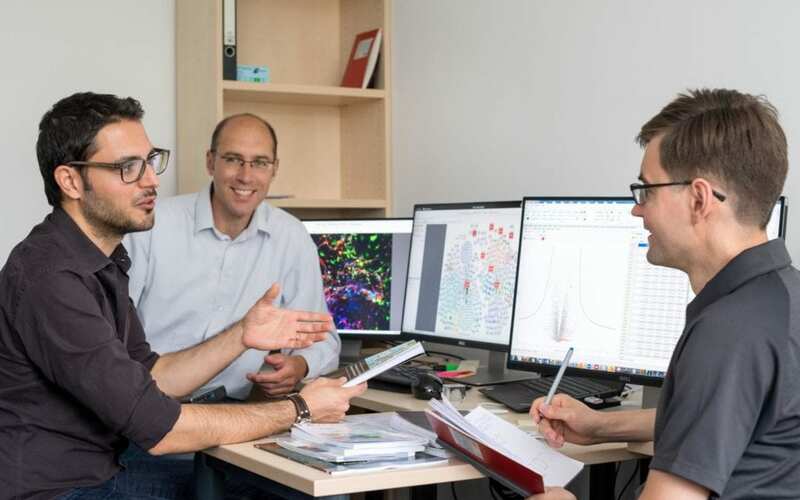 Andreas Pichlmair, Chair for Viral Immunopathology at TUM, and his team from the TUM Institute of Virology and MPI-B have examined how Zika virus influences human brain cells. They identified the virus proteins with the potential to affect neuronal development in the developing brain. "Zika virus is closely related to the Hepatitis C virus and certain tropical diseases such as Dengue and West Nile virus. It is, however, the only virus that causes brain damage in newborns," explains Pichlmair, who headed the recent study published in the science journal "Nature". The researchers discovered that the virus uses certain cellular proteins to replicate its own genome. These molecules are also important neurological factors in the process of a stem cell developing into a nerve cell. "Our findings suggest that the virus takes these factors away from brain development and uses them to replicate its genome, which prevents the brain from developing properly," explains the virologist. When the team headed by Pichlmair removed the factors in the cells, the virus found it much harder to replicate. The researchers were able to demonstrate which virus proteins come in contact with these development factors and cause the brain defects. "Previous studies revealed the virus proteins necessary for the packaging or replication of the viral genome but it was enigmatic to understand how these proteins influence neuronal development. It appears that viral proteins are responsible for causing the serious defects in the unborn – unintentionally we presume," says Pichlmair. In their comprehensive proteomics survey, the research team identified cellular proteins that were altered chemically or numerically by the virus or which bound to virus proteins. In this way, they were not only able to illustrate possible reasons for the caused deformities, but also obtained a very clear picture of how the virus reprograms the cell to use it for its own replication. The influence of Zika virus on the cell was found to be dramatic: Nine percent of all cellular proteins were chemically altered, and virus proteins interacted with more than 380 cellular proteins. "Our comprehensive dataset will hopefully lead the way for other scientists to develop therapeutic approaches for the elimination of Zika or related viruses," says Pichlmair. Pietro Scaturro, Alexey Stukalov, Darya A. Haas, Mirko Cortese, Kalina Draganova, Anna P?aszczyca, Ralf Bartenschlager, Magdalena Götz and Andreas Pichlmair: An Orthogonal Proteomic Survey uncovers novel Zika virus Host Factors, Nature, September 2018, DOI: 10.1038/s41586-018-0484-5. The study was funded by the European Research Council (ERC) and carried out at the German Center for Infection Research amongst others. Andreas Pichlmair holds a DZIF professorship.